This is a copy of the GretagMacbeth ColorChecker® SG. 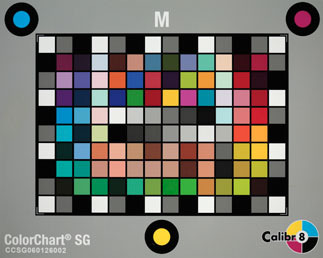 The ColorChart® SG is manufactured by Calibr8 (www.argraph.com/catalog/calibr8.htm). It is available in three sizes; a small pocket size to a very large size. The sample tested was the ColorChart® SG in the M size. Like the ColorChart® v1, the ColorChart® SG is an inkjet print laminated to a foam board. The ColorChart® SG has a printed black frame, so the surface is uniformly flat. The surface is thus more susceptible to damage without a frame to help protect the patches. The white paper used for the print fluoresces, but not as much as the ColorChart® v1. The spectra of the patches show the same problems as the ColorChart® v1, the grays are not spectrally neutral, with a defined peak at 500-510 nm, plus an increased red reflectance. This peak appears in almost all the patches. There are no row or column numbers, which presents problems referencing particular patches. Patches in columns 6, 7 and 8 in row 8 have almost the same spectral reflectance, unlike the GretagMacbeth ColorChecker® SG. It is cheaply made yet costs almost as much as the ColorChecker® SG. The XS version is exceptionally high priced for the chart size. The gray frame is problematic for profiling because it will increase veiling glare, especially effecting the dark colors. Each chart comes with a batch calibration CD. There is some unexplained variation between batches since the sample XS version has a pinker gray border than the sample M version. The Calibr8 ColorChart® SG was measured with a GretagMacbeth Spectrolino® equipped with a D65 filter. The spectral data was acquired, averaged and analyzed with SpectraShop™.